The night after the inauguration I downloaded my photos of the crowds on the mall. 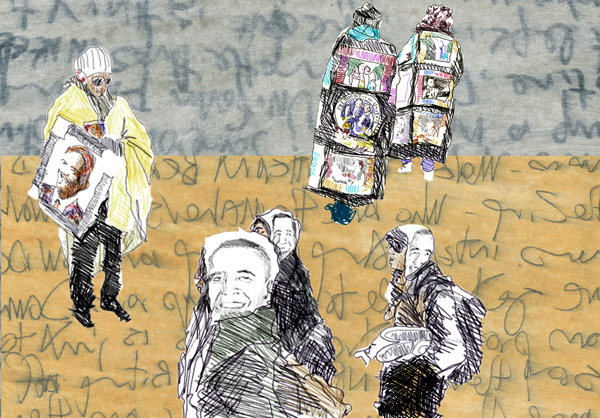 Images of the quilts that women wrapped themselves in along with photos of Obama and his family infiltrated my dreams. The hats with Obama's name the t-shirts that said, "yes we did," flashed before me again and again . 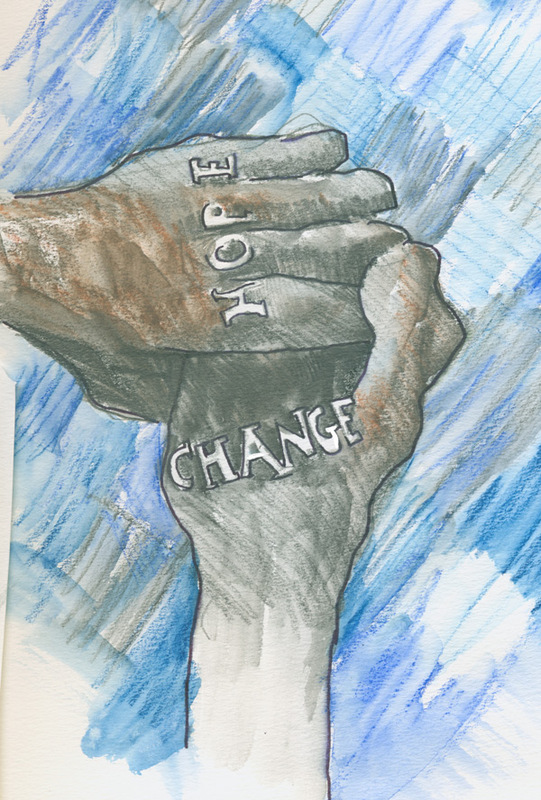 And then Amanda's black gloves floated in front of my eyes with the words inscribed on each finger... hope and change. The lines of Elizabeth Alexander's poem invited me in. A friend suggested we memorize it and that idea pushed my attention. Collages give me a reason to copy compulsively, line-by-line, and layering color adds inspiration. Cutting, pasting, cropping, and seeing contrast made it illegible. all of which led me to make a poem-inspired series of text plates. I have learned to bump into the world in words. Intuitively, I translate the planet in images and movement. I roll my clay into flat sheets like pie crust. I layer the raspberry red earth with a coat of creamy white slip. And then I inscribe it with the velvet and spinney words of Alexander's poem. The language is whispered and declaimed in my scratching scrawl. Considered as expressions, each line is copied as they are committed to my Swiss-cheese memory. 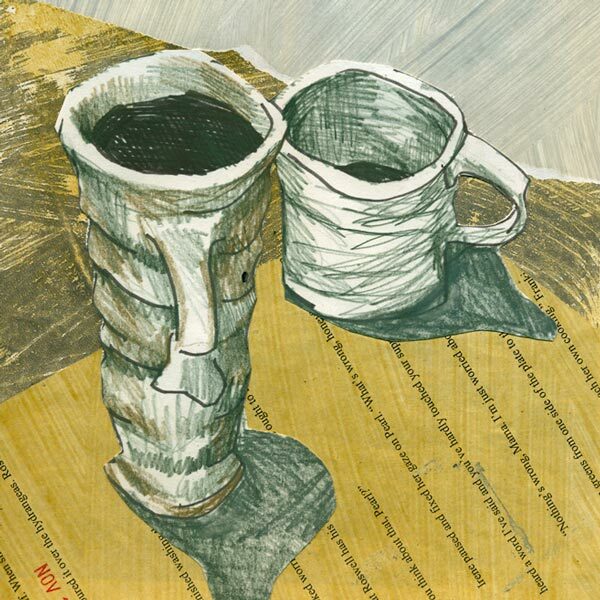 I cross the gravel road and pound these pancakes of clay into vessels for deep ideas. We are walking with raw materials into that which we cannot see. I am hand lettering these words into plates to place them at the kitchen table, shrine of the everyday. The sharp sparkle of winter light has inspired new equipment to be made, new sentences begun. I have moved past the brink and am walking forward into the reflected light of an icy morning. At the start of the New Year I find myself looking back in order to step forward. My college-age daughter sat on the couch and looked through her notebooks starting from first grade, reading out loud choice bits. It reminded me of all the stages in her path of learning to write and read, as well as how I companionably tussled with documenting her growth, transforming these experiences into artistic fodder. One result was a set of stamps based on some scribbles that she had done of imagined script. 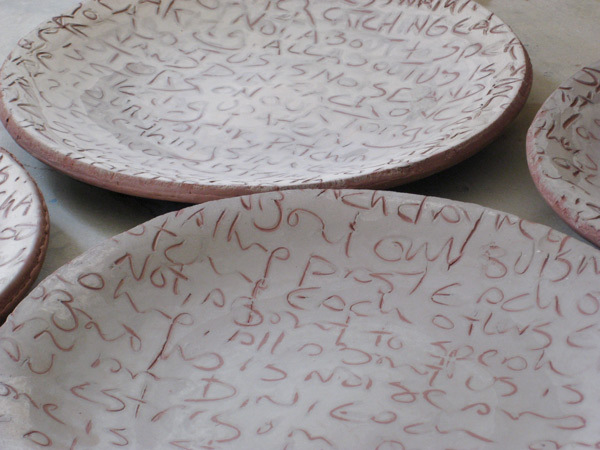 While my daughter was learning to read words, I thought about learning to "read" pottery, an often slighted visual skill. 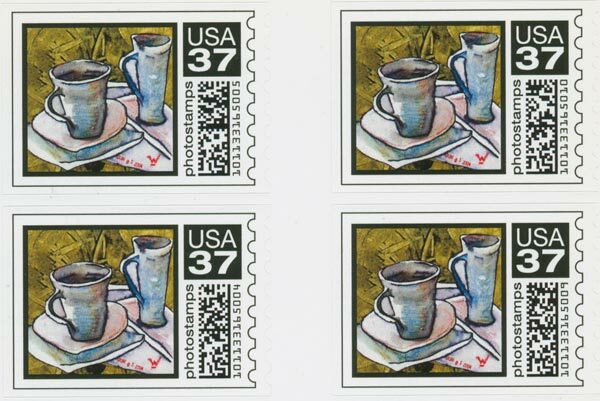 I made several stamps on this theme, some of which I used in a 2004 essay titled, "consider the postage stamp." 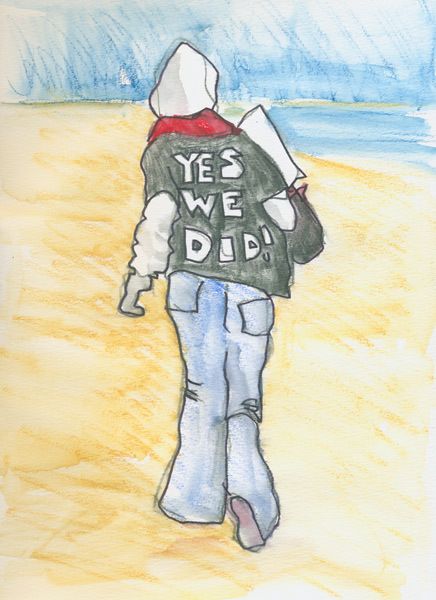 Recently, Jennifer New asked me to contribute to her nascent blog-entry about lists, lists being a common New Year endeavor. As I read through the list I had made for my 50th birthday, there it was, "design a postage stamp." My end of the year clean-up retrieved last year's Christmas gift card for making a page of stamps. So on New Year's Day I used one of my collages for a new postage stamp. 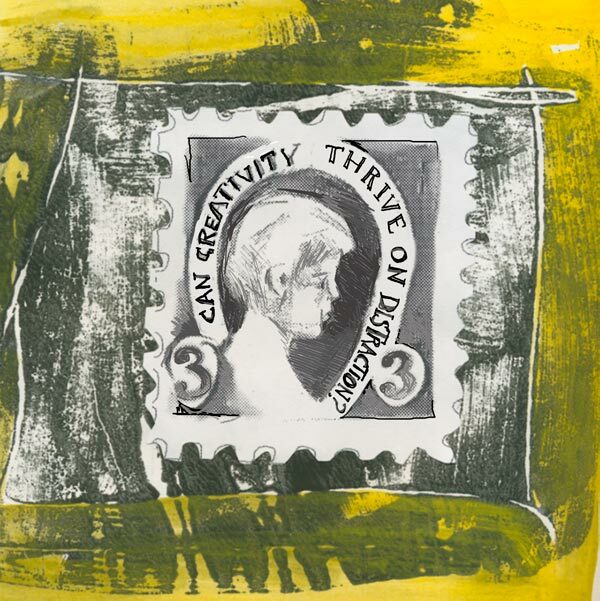 Sunday, Jennifer sent me her blog post at Mothers of Invention where she used some of my collages and an essay I had written which features my stamp "can creativity thrive on distraction." 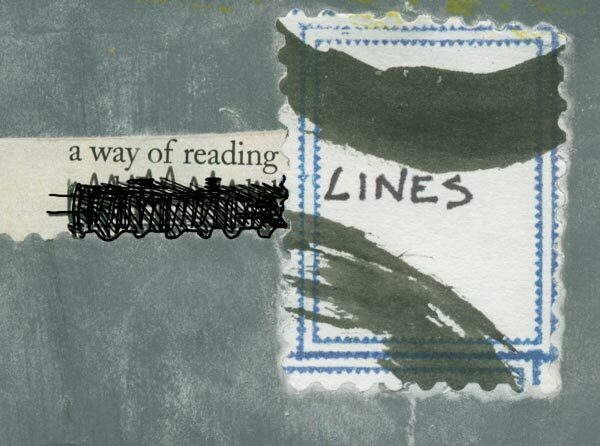 Today I looked through sketchbooks and postcards from the early 90s to find some more postage. I consider the postage stamp whether it's on a love note or a bill, a tiny piece of art stuck to the mundane artifacts of snail mail. I love postage stamps and I have wanted them to reflect a handmade aesthetic. 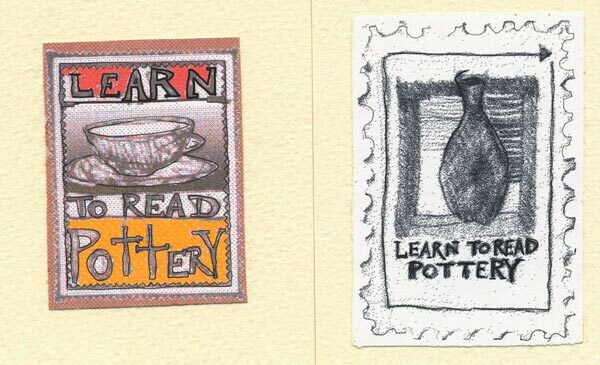 When I left home (for school) at the age of sixteen my mother sent me a postcard each week. Her handwriting was hieroglyphic-like. When I wrote her back, the placement and selection of stamps was a carefully considered choice. I had a friend when I lived in France who would go to the post office to buy the smallest, most varied postage to cover her letters sent home. I was envious of her efforts, but found myself intimidated by the French postal workers. My tentative artistic desire and simple French could not withstand their glare. I would save postage from international letters and make tiny drawings that represented my imagined portals into a greater form of communication. Years later, I discovered boxes of old stamps in my father-in-law's basement. 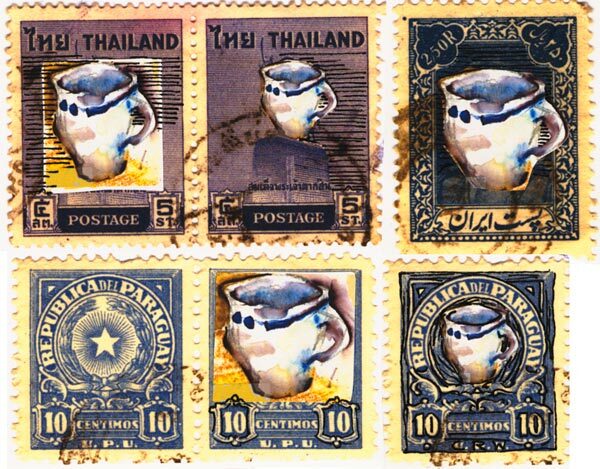 He gave me boxes of canceled foreign stamps from a boyhood friend once he found out how much I enjoyed their variety and wanted to use them for collage.